EasyCare has received notice of allowance for three new hoof boot patents! After thousands of hours and a great deal of money invested, EasyCare has received three new utility patents covering our hoof boot designs. The process for one of the patents started in 2004 and we received the official notification on December 9th, 2008. Another of the granted patents was first filed on Feb 11, 2003. It's been a long expensive process. The US Patent Office has made the patent process much more difficult over the last five years and has driven the costs for small businesses like EasyCare way up. Time and attorney costs continue to increase as the patent office tries to narrow claims to the point they no longer protect your invention. It's an interesting process and one that I actually enjoy. If I had to go back to school and start a second career it would be in patent law. The most important utility patent of the three covers a gaiter concept and how it wraps around the back side of a shell. This patent is solid and has some broad claims. One of the utility patents covers the Boa Horse Boot and the last covers a hoof boot buckle design. In addition to three utility patents we just received notice on, we have two additional gaiter patents pending. EasyCare now owns 9 utility patents and 1 design patent. In my personal opinion design patents are useless and a waste of time and money. Design patents offer little to no protection on inventions. 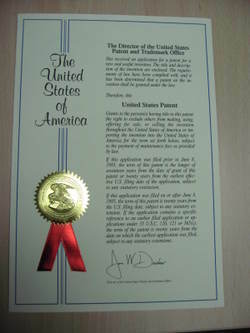 I included one of our past patents to show what the official document looks like. I just received a notice from the US Patent Office that a new EasyCare patent has been approved. Great news! We have several patent applications pending with the US Patent Office. It's really important to slowly move each pending application through the process and get them to the patent stage. As a company we have been trying to stick to hoof boot designs that have unique concepts and patent potential. The Edge and the Evolution hoof boots designs both have additional patentable features that we are working on protecting before launch. I just received a notice from our attorney that we have received a "Notice of Allowance" for one of our patent applications. This is an important patent and will help EasyCare protect our product range. Great News! We just received an office action regarding one of our patent applications. We have a couple small changes to make and we should be home free. This is great news and will allow us important protection on some of our most recent designs.